Sixty-Six years ago today, the Japanese attacked Pearl Harbor. Here's a really good website recollecting the series of events of that day. The History Place. 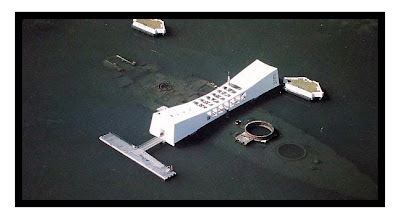 The picture above is the memorial of the USS Arizona which was sunk on that day. I remember watching a movie called "Tora Tora Tora!" when I was young. What an epic movie. That's when my Dad explained to me the history of the attack of the Pearl Harbor. I was intriqued at the time because of the violent relentless surprise attack on a early Sunday morning. No one was prepared for this attack, in fact, most everyone was at Sunday worship. I was trying really hard to understand war with my naive childlike mind and couldn't grasp the thinking behind such brutal attack. Kamikaze pilots would actually crash into their target rather than bail and survive a crash just so that it can create a bigger impact on the attack. I thought to myself, why would anyone hate another so much as to terminate oneself than to survive and preserve another life? I wasn't sure I was impressed with their persistent and focused attack without regard for their own preservation, or was I just dumbfounded at the way adults rationalize brutality and violence not to mention attack of civilians and enemies that had no way of defending themselves. Where was the nobility of being a soldier and wagering war against your enemy? To this day, I still don't understand war. Why would anyone opt to take a lose-lose situation vs. a win-win situation for all parties? Negotiation? Communication? Senseless death? Perhaps, I value my life... all lives very much. Perhaps, I will never understand war, killing one another and for what purpose?